Beautiful Unmarked ivory with silver blue cloth interior. The car has been with the same owner for the last 35 years. During this time no expense has been spared in keeping the car roadworthy and looking good. Initially, appointed Alfa Romeo agents serviced it, but as the years passed, and the car became a “Classic”, alternative sources of maintenance were sought. 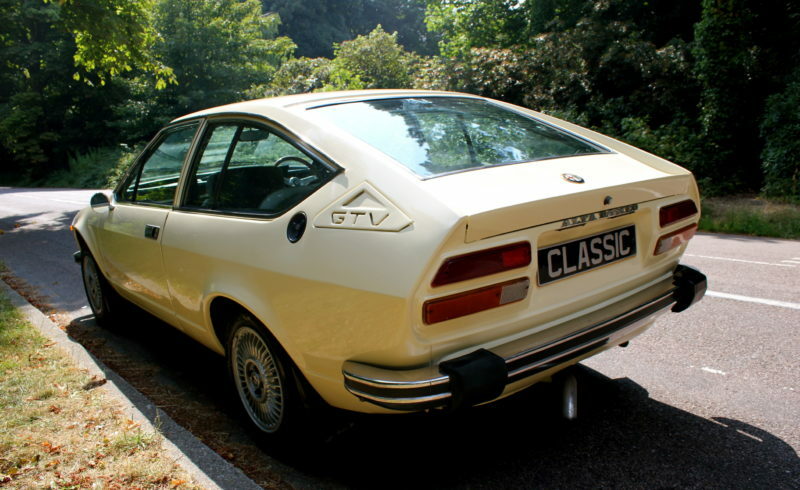 The first bodywork rectification was carried out by Allan Perry Garages in Nottingham in 1984. Allan Bennett of the renowned company Benalfa in Westbury Wiltshire satisfactory carried out subsequent work in 1988 and 1992. Another visit to Allan Perry was required in 1996. These inputs, at approximately four year intervals, kept the car to a high mechanical and cosmetic standard. By the end of 2001 the car was in need of major attention, rust was building up in all the usual Alfa places and any delay would potentially have serious consequences. Engineering maintenance was now being carried out to a high standard by Red Motori in Blandford Forum and, on their recommendation, Tony Williams in Sturminster Newton, Dorset, was selected as the bodywork contractor. Baesd on a detailed work scope and a ‘fixed price’ contract, work commenced in 2002. Progress was monitored on a regular basis. The meticulous preparation of the bodywork panels down to bare metal, including the doors and skills, the refitting of the windscreen and rear window, the priming of the body shell, the corrosion inhibiting of the box sections, all were carried out with a particular attention to detail that delivered a result which surpassed all previous work. On collection, it looked as if it had just come out of the dealer’s showroom. The car’s last MOT was from Melbury Motors in Shaftsbury. It has been in storage for the last seven years, It has now been recommissioned, it has had a Full health check and comes with 12 Months Mot & 6 Months Tax. It has just had an service with an oil Change and new filter, Spark Plugs, HT Leads and a new fuel pump. This Little italian gem is a real practical classic, with its 5 speed gearbox, Cassete player and 128 bhp twin Cam engine you could be confused in thinking you were driving a much newer car. It well worth coming down for a viewing as the pictures just dont do it justice, but we have warned you it will be very hard to resist its italian charm.